Sleep away summer camp is, in my mind, the best thing that can happen to a kid. But a sleep away camp on Torch lake, that must be something special. Mine was a Girl Scout camp on Lake Gilbert in Wild Rose Wisconsin. Just this morning, at church, i was telling someone who’s kid had just returned from camp that we didn’t see a bar of soap or warm water for two full weeks and are now healthy, thriving 50 somethings. I was sad to hear when the Wilmette GS council split my beloved Camp Timberloft into 10 parcels and sold them off for a song. I have dreams still of walking through those woods, full of skeeters and chipmunks and feeling like the world was mine and I hers. Your post brought back a flood of memories of those carefree weeks in the woods…thank you. Camp Timberloft is a very fond memory for me as well. I was a counselor there the summer of 1977-right out of high school! I was a CIT (C-in training) there and at Camp Windego the previous two summers and a camper summers before that. I met my husband at that camp (he was visiting another counselor before camp started) and we’ve been married for over 31 years. Our company is called Wild Rose Management in honor of where we met! I went to Camp Timberloft until I was 17, (1973). That place saved my life, I remember there was somebody named Kit, a fellow camper, when I was there, don’t know if that was you, my name’s Denise (I go by Deni now) and my favorite counselors were Judy Zito (Doodleloo) and Mary Ann Johnson (Maj). Are you still up there? I want to take my 24 year old daughter to Wild Rose this summer to show her her mothers spiritual homeland. Let me know if you have any recommendations on where to stay. Hi Denise, The summer’s of ’75 and ’76 was when I was a Counselor In Training at Camp Windego. I was a camper there the previous 3-4 summers. My name was Kitty. I was a counselor at Camp Timberloft the summer of ’77. I never lived in the area as I was from the Illinois Shore GS Council (suburbs just north of Chicago). The properties on Lake Gilbert (Timberloft) and Hills Lake (Windego) were sold in the early 2000’s. You may want to contact the mayor of Wild Rose for information regarding the area as it has probably changed a lot since we were there. I am now living north of the Atlanta area in Georgia! Hello Mike, Glad that someone is enjoying the property! I haven’t been back since I left in ’77-life has taken me to other parts of the US! I have to go digging into boxes for old pictures so that might take until this summer. Hopefully in a few summers, I’ll be able to swing back around for a visit as my working life is coming to a close soon. As with so much of what you write…..I wish I were there! And as Nancy says, amen to all that! Dear Mother God of Mothers Who Let Their Young`uns Go Off to Adventures Of Their Own…bless them and keep them from worry. Keep an eye on my mother who let me disappear for two weeks every summer even though I was her oldest of the large brood and was her primary aide de camp at home. I thank her for the time to just be me and discover who that \”me\” was away from familiar expectations of neighbors and family. It was a most valuable time in growing into \”me\”. I also am grateful for the many camp songs that are still firmly rooted in my brain bank. I love them still and sang them to my children when they were little and could tolerate this. dear mother God of mothers and friends who so deeply understand the tugs and pulls of all the forks in all the mother road, and most especially who pay attention to the tender hearts and brave hearts among us. to a long life of camp songs, indeed. on that note, dear mother God, might you drop down some cozy earplugs? kidding!?!?!? chair people, i am struck as i read over these glorious comments at the table, that it should come as no surprise that you who return and return to the table have, in your sprouting days, been pulled to the deep woods, have discovered the sacred there, and endured the butterflies and bee stings and maybe even a twisted ankle, for all of it is why when mama comes back to pick up her little one at the camp gate, that child looks as if she/he’s grown half a foot, but more essentially spread his/her wings and soared. maybe what we need is a first-ever chair camping trip. i know a beautiful woods, but we’d have to boot the little campers. one last note: i find this week that i am living in two time tracks at once, nearly every quarter hour i look at my watch, i think, “what are they doing now,” as i airlift my soul and my imagination to where that little boy is trekking in the woods. i just pray to God he is not buckled under with homesick blues. that’s my worst worry. 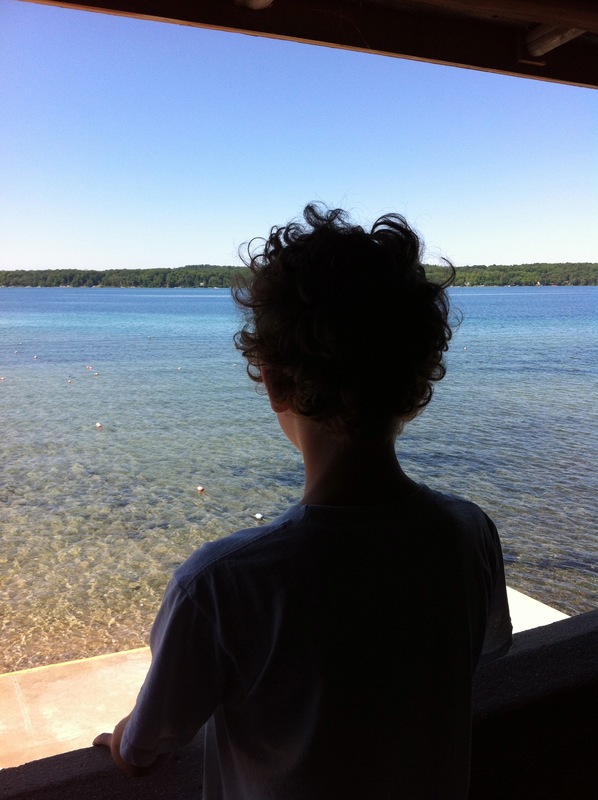 i wish you could have seen him the other night, the night before drop off, when he hopped out of bed, asked, “can i go to the window?” then stood there, moonlit face staring skyward for a minute or two. at last he made one of those signs of the cross that the ballplayers do, where they do the cross then raise a palm toward the heavens. it was a profile of courage i’ll never ever forget. took 10 more minutes of pacing, then he settled in and under back rubs and a long winding made-up-on-the-spot bedtime story, he finally fell into sleep. thank you mother God…. “The moon here looks just like the book “Good Night Moon”. It was his favorite book to read with me, along with the Runaway Bunny. I got a little teary. Our children carry us in all forms in their hearts. I know your camper has you tucked away nicely in his his heart soul and that it is in the missing each other that makes the love all the more dear. Ah, bam, a magnificent prayer that will certainly be heard–and fulfilled–in the cathedral of the North Woods. Oh, dearest bam … you speak with your heart so fluently. I can’t help remembering my emotions when I dropped Emily off at her first sleepover camp (5 days … an eternity!). I was a wreck, but she was so excited she barely noticed (at least, she never let on). Joey was different … her first camp was a full week and she didn’t take her eyes off of me as we walked to the car after checking her in. I thought I’d die. I prayed more during those weeks than most other times. They had a blast and I had to learn how to trust. Oh boy … being a mama isn’t for sissies. i keep thinking of that: it is such a blessing to be able to send your kids to the woods. it’s a luxury, and i know it. and i am so deeply grateful for it. i keep thinking of kids who don’t get to go to the woods. who don’t get to leave the noisy streets where they live….it breaks my heart that not everyone gets into the woods. shouldn’t be that way…..now should it?